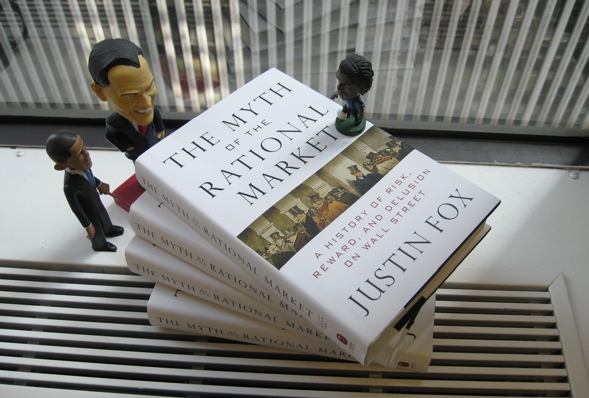 Myth of the Rational Market is the subject of the lead book review in this week's Barron's. Glenn C. Altschuler, a professor of American Studies at Cornell, describes the book in some depth and calls it a "lucid, lively and learned account." Unfortunately, unless you're a Barron's subscriber, you can only read the first little bit online. I found out about the review because Barry Ritholtz, who apparently reads his Barron's online early Saturday morning, e-mailed me about it. When I read the e-mail I was eating breakfast at the Square Diner on TriBeCa. I rushed off to find a paper Barron's, and quickly discovered that this was not a trivial assignment in TriBeCa. After 10-15 minutes of running around, I finally found a newsstand next to the Chambers Street subway station, where I blew $15 on three copies. telling anecdote: Example: a blistering takedown of the industry that Lawrence Summers gave way back in 1984, concerning "ketchup economists." Fox demonstrates clearly not only the illusory nature of monetary success, but also the illusion of superiority that wealth brings. My book demonstrated the illusory nature of monetary success? Hmmm, certainly wasn't my intention. But I'll take it. Update: On another summer reading list, St. Louis Post-Dispatch book editor Jane Henderson includes Myth as one of her 15 nonfiction picks because it "makes business history thrilling." Wonder where she got that idea? On Popmatters (because if financial theory isn't a pop matter I don't know what is), Rob Horning writes a review/essay about Myth of the Rational Market that's generally positive (and extremely erudite) but complains about the "slurry of names" and my "stubbornly neutral" narrative stance. That last bit is something of an exaggeration, but Horning is definitely onto something. I made a conscious decision to keep lots of people's names in the story and to shy from polemics because I figured that would give the book a better shot of getting onto business school reading lists. We'll see if that works. manageable—and how their efforts often made things worse. Finally, Salon's Andrew Leonard notes in passing that neoclassical economics "is utterly demolished in Justin Fox's soon-to-be-published The Myth of the Rational Market." Wow. I had no idea. me, shareholder value was not about an immediate boost to stock price." targets. And in doing so they made their companies less valuable. You know, somebody ought to write a book about this. Seriously. I felt kinda lightheaded after reading this. It was sort of my dream of how reviewers might see the book. But I wasn't entirely confident that the book merited such an endorsement—I'm way too close to it, and way too aware of the sections that fell short of what I hoped to accomplish with them. The review also says the book is being published in July by Collins, when in fact it's being published in June by HarperBusiness (the Collins label has been shut down). Not that I'm complaining. University of Wisconsin economist Menzie Chinn discussed Myth of the Rational Market on Econbrowser a few weeks ago (and said nice things about it), but today we've gotten the very first bona fide review of the book. It's in Library Journal (seven reviews down) and it's pretty positive, with a slightly aggravating twist at the end. finance or people interested in financial theory." Well, maybe in Palatka that's who it's best suited for. I certainly wrote the book with students of finance and people interested in financial theory in mind. But I also tried really really hard (and mostly succeeded, I think) in making it accessible to lay readers. A couple years ago I doubted whether many lay readers would ever think of buying such a book, but nowadays there's a pretty big audience of people interested in how financial markets (mal)function. Right?